AAAA resume service is a registered business. We have a team of dedicated professional resume writers. •. We can highlight your strengths and abilities for the job and get your resume noticed and you on the short list. •. We can make your resume shine and fine tune it to each individual job you wish to apply for. •. One of the pet hates of recruiters is that a resume looks "generic" meaning same one sent to all employers / recruiters. •. It is a known fact employers / recruiters respect a candidate who has done their homework and researched a bit about the company. If your resume is obviously specifically focused on that job application and you have shown a bit of interest, enough to research their company, you're a winner. Your resume is the most important tool you will ever have. It showcases your skills, abilities and qualifications for the job you are applying for. It needs to be concise, straightforward and "sell" you to the employer. Let's face it! Employers are sifting through numerous resumes. What makes your resume stand out? Let us give you that impact. Stand out amongst the crowd - shine. Dynamic, amazing, stunning that's what you want. 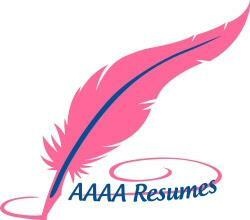 It's your future, you want to land a job - that job - well you are on your way at AAAA resume service. We also offer full virtual assistant / Secretarial office admin services as well. Transcription both analogue tapes and digital, bookkeeping, website development and management, data entry etc. Professional Affiliations: ARWA. AVBN. ACA.